This last blog in a series of three discusses DMARC, which is built on top of SPF and DKIM. DMARC which stands for Domain-based Message Authentication, Reporting & Conformance is an email validation mechanism, built on top of SPF and DKIM. DMARC is using a policy which is published in DNS. This policy indicates if the sending mail server is using SPF and/or DKIM, and tells the receiving mail server what to do if SPF and/or DKIM does not pass their respective checks. One “problem” with SPF and DKIM is that the sending organization never knows how SPF and DKIM are used, and what the impact of the usages is, whether it works or not. 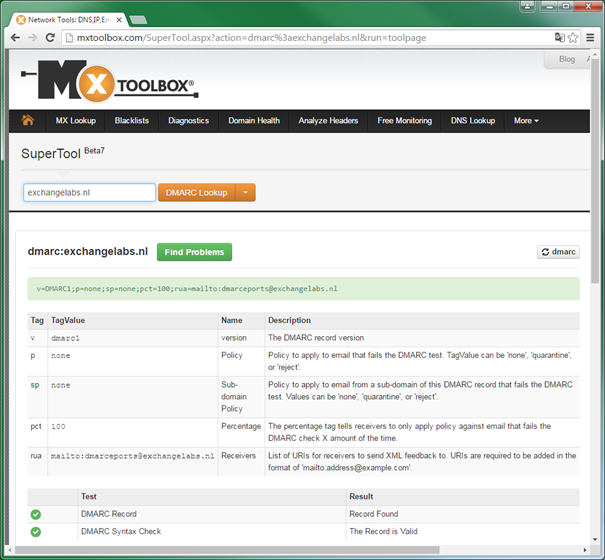 Therefore DMARC also contains a reporting mechanism. The receiving organization can report back to the sending organization about failure or passing the DMARC checks. A user sends a new message to an external recipient, the mail server signs the message and inserts the DKIM header. The mail server sends the message to the recipients mail server. The recipients mail server checks DNS for the SPF record, the DKIM records and the DMARC record containing the DMARC Policy. After checking the SPF and DKIM, the policy is applied which determines what needs to happen. If the DMARC check fails (block or quarantine) a report is sent back to the sender’s organization. So, how does a typical DMARC record look like? More information regarding all available tags can be found in the DMARC RFC7489. As mentioned before DMARC is built on top of SPF and DKIM, so the first step is to implement both in your environment and make absolutely sure both work correctly. Assuming you already have created a Mailbox for receiving the reports you can create a DMARC record with an organizational domain policy set to “none”. This way DMARC will start to work, but won’t take any action while you can analyze the messages that are received in your reporting Mailbox. Based on the header information we can conclude that all DMARC information is correct, and that receiving server can validate the information when available. DMARC is built on top of SPF and DKIM, and to have DMARC function properly you need to configure both SPF and DKIM. DKIM is policy based, and this policy is entered in public DNS, and therefore available to everyone. This policy can be set to “none” where DMARC is checked, but not action is taken, or it can be set to “quarantine” or “reject”. This latter is very strict, and when SPF and DKIM are not correct the incoming email is rejected and thus never delivered. An interesting feature of DMARC is the reporting functionality, where information regarding DMARC features at the receiving server are reported back to the sending server, making it possible for an (Exchange) administrator to analyze DMARC functionality and behavior. In the last three blog posts I have discusses SPF, DKIM and DMARC. 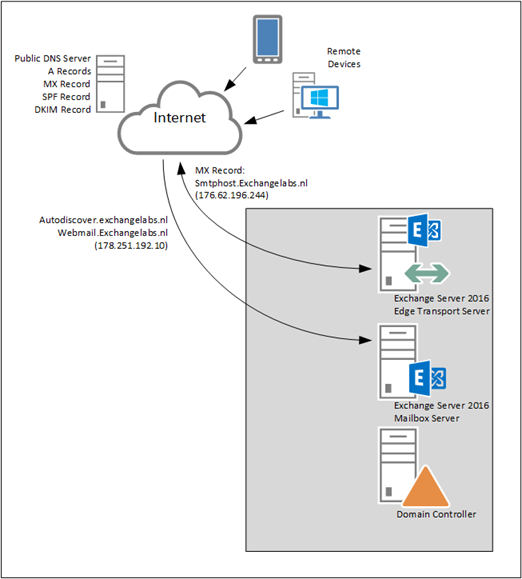 For outbound messages all three are configurable in DNS and on the Exchange server itself, but inbound is still limited. At this moment (august 2016) I haven’t found a proper (open source) DKIM verifying module, nor have I seen a DMARC validation module for the Exchange server. As soon as I find more information I will update my blogposts. Thank you for your post about SPF, DKIM and DMARC, this post is very helpful for understanding all above. I have one question relevant this post. Question: If we have enabled SPF and DMARC on our outbound email on our Cisco ESA gateway, but recipient side have not configured SPF or DMARC record, then how our SPF or DMARC will work or not? You can configure everything that’s you want to, but if the recipient mailserver doesn’t do anything, that’s bad luck. But they will receive your mail anyway, but without any validation. I do see more and more organisations working on DKIM and DMARC validation/verification though. Most servers do SPF verification (including Exchange), but that’s just the beginning. If the recipient side don’t have any SPF or DMARC record it’s not a big deal for your implementation. But, if they don’t have this configured, most likely they don’t validate your records and it’s of no use because they (the recipient) don’t use it.